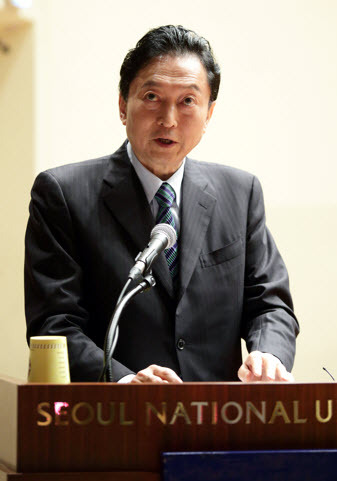 On November 5th, former Japanese Prime Minister Yukio Hatoyama (2009~2010), who had expressed a wish to converse with young Korean intellectuals, delivered a lecture at Seoul National University. 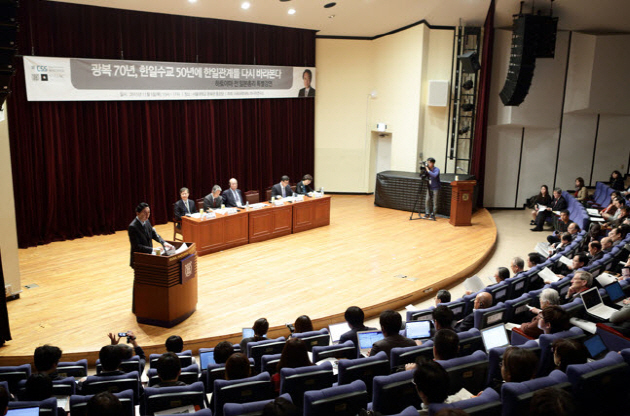 It marked the 70th anniversary of Korean independence from Japan, and was the first time a former or incumbent Japanese prime minister spoke at SNU. An engineering graduate of the University of Tokyo, Hatoyama earned a PhD at Stanford University and started his political career in the Liberal Democratic Party but later became one of the founding members of the Democratic Party of Japan, and subsequently became the first Prime Minister in 2009. Hatoyama visited Korea earlier in August for a ceremony marking the 70th anniversary of the end of World War 2. During this visit, he toured the Seodaemun Prison, where Korean independence fighters had been jailed and tortured by Japanese officials. At one point, in front of the memorial stone, Hatoyama knelt in respect, and offered a prayer for freedom fighters who were killed by Japanese police during the Japanese occupation. In his lecture, Hatoyama discussed the bilateral summit between South Korean President Park Geun-hye and Japanese Prime Minister Abe Shinzo on November 2, “It is unfortunate that the issue of comfort women and historical disputes regarding Japan and Korea have yet to be resolved. However, it is a relief that Korea and Japan have held a summit to attempt to improve relations.” He also commented on the strained Korea-Japan relations over the past decades, by expressing concern over the uncompromising nationalistic stance of the incumbent Prime Minister Shinzo Abe. Hatoyama explained that the conservative stance of Japan and the Lost 20 Years, the years from 1995 to 2007 which marked an economic recession, caused the decline of Japanese national confidence, and a subsequent lack of magnanimity. Another point discussed by Hatoyama was his concern of Prime Minister Abe’s passage of security legislation in September. These security bills revised the ground rules for military engagement, allowing Japan to commit to collective self-defense. This is a subject of heated debate as it allows Japan, for the first time since the end of World War 2, to deploy the Self-Defense Forces to assist an ally in battle overseas, even if Japan itself is not under attack. Hatoyama felt that this would lead to increased tension and an acceleration of an arms race in Asia.